Joint Base Andrews emphasizing its jointness. 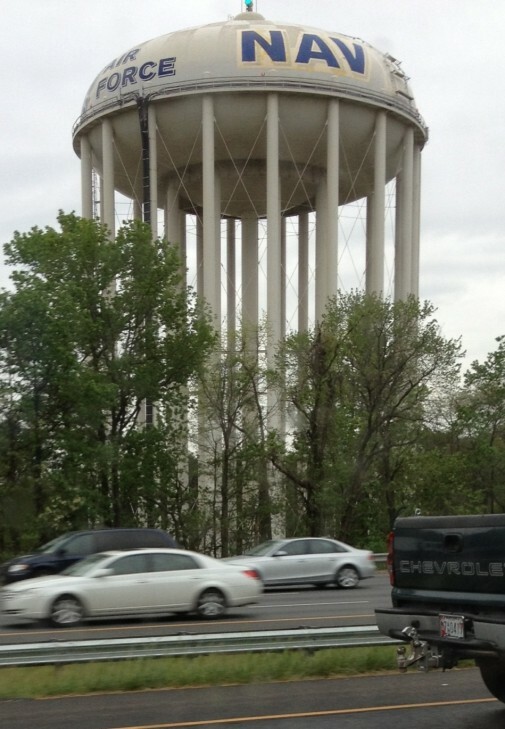 The water tower alongside the Capital Beltway has long referenced the Air Force, but today it also includes the Navy. Scaffolding and “NAV” and the outline of a “Y” were spotted on the structure. It may be a few more days until it’s done – it rained today and it’s not the best weather for painting. It may not seem like a huge deal in itself – it is just a water tower alongside a busy road – but the structure is prime real estate. It’s visible from the DC Beltway, the congested artery that a large chunk of the big wigs who live in suburban Maryland take to their jobs in Washington and Northern Virginia. And it doubles as one of the best billboards alongside any of the roads in the metropolitan region and re-brands Andrews, which has long been associated with the Air Force, and, in particular, Air Force One, as home to the Navy as well. And it only took a couple gallons of paint. I liked it better when it was just red and white checkerboard.